Event ID: 6398 6482 7076 SharePoint memory is corrupt. I read a lot of posts saying this was caused by SharePoint and fixed with SP1, and/or an issues with .net 2.0 fixed with .net 2.1. Both are incorrect for my scenario; my servers were completely up to date and all of a sudden I started getting these errors. I also read that restarting the Services Timer would resolve the issue. All of these are incorrect. The issue is caused by IIS (Adsiis.dll & Wadsiis.dll) and >2 AD users trying to access the same process. None of my dev machines have exhibited these errors because none use AD accounts. Sounds easy enough, but it wasn't immediately obvious. The below creates a list, adds a Rich Text field with full HTML and adds it to the default view. There doesn't seem to be any OOTB solution to copy list items to > 1 other site... so I wrote a quick aspx page and added it to a feature/solution which I would like to share with you. The APX page just loops through the Web collection and checks for the list and if it's available enables a checkbox so you can copy the item. The feature adds a context menu to a list item with a link to the page. There's nothing compiled so it's easy to edit (just open the solution file). To Do: Optimize sorting DataView/DataTable, add Doc Library support, add a FeatureActivated/Deactivated to add ASPX page to sitemap, add option to create list if it doesn't exist and change to a dll/code behind. Keywords: SPGridView, SPList, SPListItem, Copy, Add, Deploy, Feature, context menu. 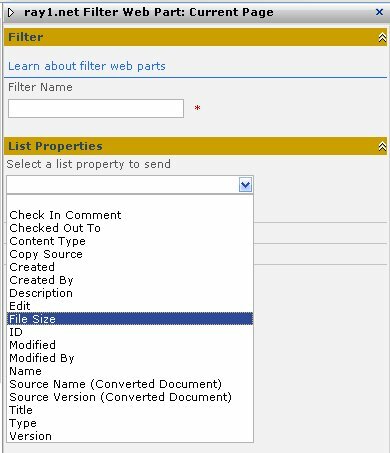 Sometimes you need to filter data (ListViews/DataViews/Other web parts) based on some criteria be it the persons name, their email, a specific date range or from a parameter. Microsoft provide a number of these Web Parts called filters. The problem is they only provide these in the Enterpri$e ver$ion. 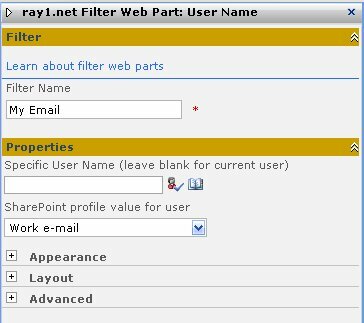 ray1.net Web Part Filters feature is comprised of 6 web parts. 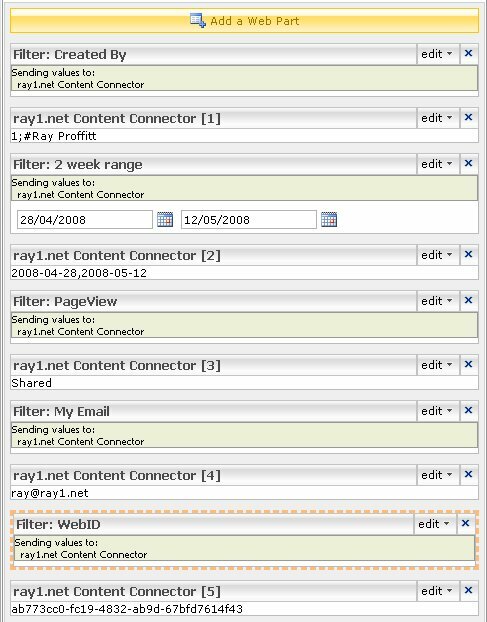 ray1.net Content Connector. This is a simple Literal Control that renders the value of a connection, or the text you specify. You can use it with, say the UserFilter and render some text that says "Welcome to my site UserFilter value!" ray1.net Filter Web Part: Current Page. This web part provides a filter connection that send information about the current page. The page needs to be in a list. You can use this to filter content based on who created the page or the file size or the modified date. 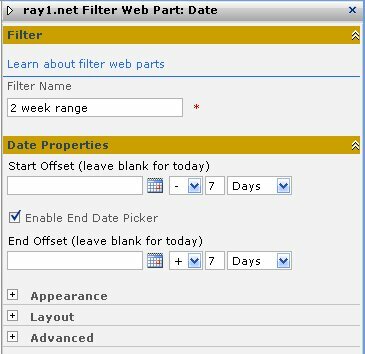 ray1.net Filter Web Part: Date. This web part provides a filter connection that sends information about a selected date or date range. Say you had a DataView web part that sent a parameter to an SQL stored procedure. ray1.net Filter Web Part: QueryString. This filter accepts a QueryString parameter and connects to another web part. Pretty simple really, name the filter the same as the querystring parameter and your done. ray1.net Filter Web Part: User Name. This web part provides a User Name connection filter. This web part makes this feature incompatible with WSS v3, as I use the "Microsoft.Office.Server.UserProfiles.UserProfileManager" class. ray1.net Filter Web Part: Web ID. This web part provides a filter connection that sends the Web ID. 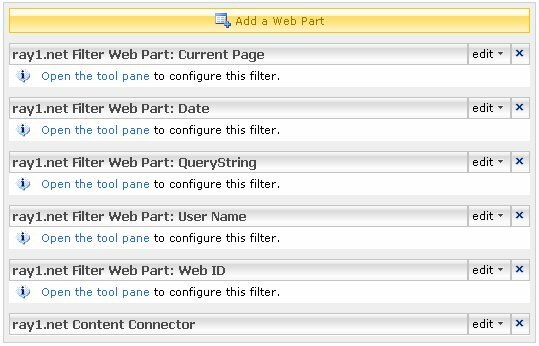 Another simple one, but useful... Say you have a bunch of sites using the same template and you wanted to filter an SQL query. All the filters accept multiple connections, and this is what they look like in edit mode. To do: I could add a Text Filter and maybe change the Content Connector to accept n number of connections. If you have Report Server running in a virtual directory under a SharePoint web app. Error: The type Microsoft.SharePoint.Portal.Analytics.UI.ReportViewerMessages, Microsoft.SharePoint.Portal, Version=12.0.0.0, Culture=neutral, PublicKeyToken=71e9bce111e9429c does not implement IReportViewerMessages or could not be found. <add key="ReportViewerMessages" value="Microsoft.SharePoint.Portal.Analytics.UI.ReportViewerMessages, Microsoft.SharePoint.Portal, Version=12.0.0.0, Culture=neutral, PublicKeyToken=71e9bce111e9429c" />. 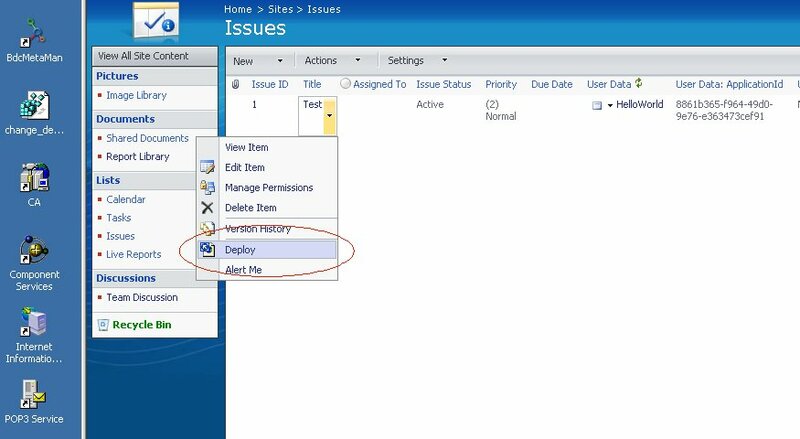 Fix: I looked at the Microsoft.SharePoint.Portal.Analytics Namespace and couldn't find a UI.ReportViewerMessages, so I just removed it from the web.config and I haven't experienced any issues. This also applies to the error message: Microsoft.ReportingServices.UI.Global+RSWebServiceWrapper+CantCommunicateWithReportServerException: The report server is not responding. Verify that the report server is running and can be accessed from this computer. This took me a little while to figure out, but my initial suspicion was that it was related to the fact I was using it in a Host Header site, ei: I had changed lmhosts or I had multiple web sites using port 80. Report server uses the machine name when setting the config files, but when it tries to reference the url it can't be found because it's in another web site. In my case the server was called MOSSDEV, and the report server virtual directories were in a web site called premisys. Open "RSWebApplication.config" in the "Report Manager Virtual Directory". Right click the virtual directory icon in inetmgr, choose open. Enter the full Report Server URL in the <ReportServerUrl> node. Delete the <ReportServerVirtualDirectory> value but not the node. Open "rsreportserver.config" in the "Report Server Virtual Directory". to the user VMDomain\SPConfigAcct SID (S-1-5-21-2183741768-1351022156-4028051374-1111). This security permission can be modified using the Component Services administrative tool. The event kind of tells you how to fix it: "This security permission can be modified using the Component Services administrative tool". You need to grant the "user" rights. My user is a SharePoint Config account and as such belongs to the IIS_WPG group, but is also the sole member of WSS_RESTRICTED_WPG group so using the safest security I'm going to use WSS_RESTRICTED_WPG until more errors appear. Because it's not going to need to lauch or activate remotely I just need to enable "Local". SharePoint Calculated Fields Use Excel Formulas. I was recently tasked with resolving a date issue for a Global Portal. People outside the US were complaining about the date format (MM/DD/YYYY)... I've long been a proponent of ISO dates (YYYY-MM-DD) and 28 day months... OK maybe 28 day months wouldn't be so fun for savants to calculate. Anyway the solution was obviously to include the month name. My first reaction was to change FLDTYPES.xml, then to create a custom field type, and finally it soon became obvious a calculated field should do the trick. So I searched a minute for a formula to render the date with the month name in the middle... I didn't find any so I created it. It is a piece of cake to do it in VB and C#, but what does a calculated field provide? As it turns out quite a lot. Everybody knows your classic [Today], LTrim, etc... but what I didn't know it that it supports a lot of Excel functions (not the VBA ones).